NSW farmer Matt McKinley thinks carefully before he answers a question. After he answers, he is apprehensive that he may have said the wrong thing. He says he doesn’t have all the answers, and that he is making plenty of mistakes along the way. And for all those reasons, the perfect place to share his story is within the pages of this magazine. Farmers helping farmers. Nothing more, nothing less. This is one farmer’s story…. More than 20 years ago Matt started farming with Dad Dave and Mum Heather near Coolamon, NSW. His parents were early adopters of minimum till techniques, reducing tillage and retaining groundcover, although their farm was mostly focussed on their self-replacing merino flock. During the late 1990s and early 2000s their focus started to shift more towards cropping and there was a general feeling that sheep were starting to compromise cropping decisions. Seeing the sheep with clouds of dust behind them remove the groundcover they’d been working hard to keep through reduced tillage and minimum till, pushed them closer to making a change. Then came the Millennium Drought, one of the longest on historical records. Reluctantly, and not unanimously, during the mid 2000s they removed sheep completely from their system. “We saw instant improvements and efficiencies with cropping from labour to paddock layout, machinery cost ratio – everything improved almost instantly,” Matt says. This led to a complete changeover to a controlled traffic 9-metre, no-till, stubble-retaining system in 2007. They were still in the grips of drought and not many farmers in the district were farming this way, but they were confident it was the right change for them. As the drought started to ease, the better seasonal conditions allowed them to continuously crop, and they were achieving really good results. It was a predominantly wheat-canola rotation, the numbers stacked up financially, and this worked year after year. They believed they were maintaining soil health and running a sustainable system by replacing elements they were removing. Matt says they felt the more inputs they put in, the better job they were doing for the health of their soil. Then paddocks seemed to become tired. The train of thought at the time was that they needed more synthetics to fix soil health. Soil tests revealed really high levels of macro and micro nutrients. This got them thinking there had to be something else other than just numbers on soil test results to measure soil health. Matt says he knew there must be something else going on in his soils and he started investigating, reading and watching You Tube soil health videos. Although he was starting to understand there were more than soil test results to measuring soil health, he still couldn’t make the dots join up. It was when they upgraded their farming system ‘ideal’ from being sustainable to being regenerative that a light went on. They recognised they needed more plant diversity and introduced pulse grain crops. Further to that they introduced a percentage each year of a manure ‘sacrificial’ crop, which was legume based, in a monoculture form. They achieved reduced inputs, reduced need for nitrogen and other elements and their crop gross margins improved. Matt admits he remained frustrated because he still didn’t really understand what it took to improve soil health. Although he knew what he wanted to achieve he didn’t know how, or why. That’s when a good friend and mentor Ben Beck persuaded him to jump in the vehicle and head to Victoria for the 2014 Vic No-Till conference week. World-renowned soil health, multi-species cover specialists Jay Fuhrer from Bismarck, North Dakota was the international keynote guest. Matt says the trip was a real ‘kaboom’ moment. Matt also spent one-on-one time with Jay, who highlights the relationship between diversity and soil health. When Matt got back to his farm he continued his research and learning with increased intent and added inspiration and understanding. Matt met Jay again earlier this year on a SANTFA study tour to the US with Vic No-Till and reminded him of their meeting two years ago. This US tour was another kaboom moment for Matt. He’d formed a lot of his own opinions before he left but the tour opened his mind to more new ideas and methods. Matt also found it valuable to be in an environment where you could speak openly and ask people questions who had regenerative experience as well as runs on the board. Matt says that whilst their no-till farming system has developed to a stage where they can be quite productive, many of the productivity gains are being made by simply treating symptoms as they occur with the use of synthetic inputs – fungicide, insecticide, herbicide and fertiliser. “The question I ask myself every day is why is our system so reliant on these synthetic inputs? Is it because our soils are in fact degraded as well as our natural ecosystems? The US trip helped me to acknowledge that despite our best efforts, our soil is in fact degraded and by using plants it is achievable to regenerate soil by increasing soil carbon and restoring biological function. Matt and his family had made changes long before the US trip such as introducing multi-species covers, broader cropping rotations, summer covers and warm season cash crops but when he returned, he made a big one. He re-introduced livestock. He says it’s all about increasing diversity in their system. Matt admits his parents are sceptical about the paradigm shifts in Matt’s thinking but with this comes their 100% support. Matt says he continually draws inspiration from others including growers from the Vic No-Till network, his agronomy consultants Greg and Kirrilly Condon from Grassroots Agronomy and neighbour Ben Beck. He has also developed a strong rapport with Rick Bieber from South Dakota, who he met during the US tour in February. Rick visited Matt’s family’s farm in July. When Rick visited Matt’s farm he not only impressed Matt, but Matt and Belinda’s 12 year old son Connor. Another person who has got Matt thinking is award winning agroecologist Dr Johnathan Lundgren from South Dakota, who they visited on the US tour and was a guest speaker at Vic No-Till’s Underground conference in July. Matt says his realisation that soil is alive is the key for the paradigm shift in his thinking; the changes to his natural thought process. “The change from thinking my soil is a chemical medium to a living biological organism was huge. When I was younger I never thought soil was alive, it wasn’t in any agronomic text book that I studied. I truly believe that among other things, the lack of plant and ecological diversity in our farming system over many decades is the major problem inhibiting the natural resilience in the system. Hence causing an increase in reoccurring symptoms which we need to treat with fungicides, insecticides, fertilisers and so on. Matt says they are only taking infant steps at this stage but so far they like what they’re observing. The major concept when designing multi species covers is to identify your resource concern (reason for planting a cover) and select species which will best address that. Different plants will provide different benefits to soil health. Try to choose species which will compliment your next cash crop. 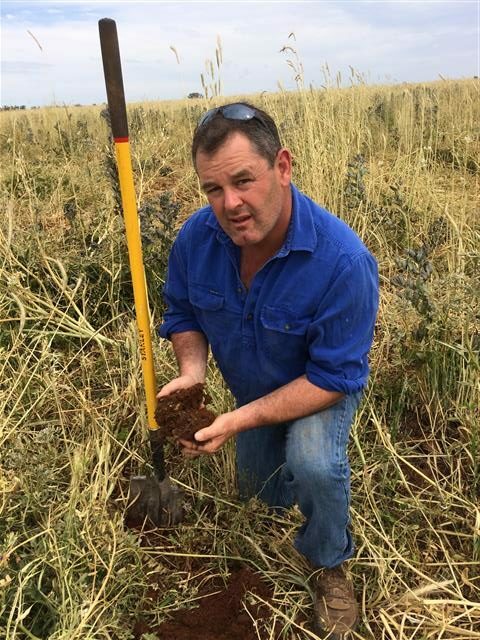 This year Matt has set up a 130-hectare paddock multi-species cover trial. He planted a winter multi-species in autumn, grazed to cattle during winter for 100 days, desiccated the crop in spring and planted a summer cash crop. Half the paddock is planted to sunflower, the other half is corn. Your farm was historically a sheep property, why did you remove sheep completely? We reluctantly and not unanimously removed sheep during the Millennium Drought of the 2000s for a number of reasons. Low wool and lamb prices and the fact that sheep were frowned upon in a no-till farming system which we were implementing at the time. Did you notice improvements in your no-till system after the sheep were gone? Yes, with sheep gone we saw instant improvements and efficiency with cropping, labour, paddock layout changes, machinery cost ratio improved, everything really improved almost instantly. A decade later, you have re-introduced cattle into your farming system. Why? When on a study tour to the US earlier this year with SANTFA and Vic No-Till, cattle were a big part of the regenerative agriculture farms we visited. Hearing the US guys, how passionate they were about the contribution livestock grazing in the multi-species crops make to biological soil health, was a real key learning point. They were very passionate about managed grazing and grazing soil that has live plants in it – the cattle act as biological distributors. Can you outline the role cattle played on your farm this year? We took a measured approach to the livestock enterprise. We recognised a 100-day grazing opportunity on our already established multi-species winter cover crop area. Cattle needed to be off the paddock in early spring to allow the cover to be desiccated and summer crop planted in a timely manner. When purchasing the stock we targeted a type and weight class that should be suitable for feedlot entry after the 100 days of growth. The paddock was cell grazed which was a technique we had not previously tried, and we still have a lot to learn about that. How did you turn your thinking around from believing stock cause damage to the soils in your farming system to the thinking that they benefit soil health? During the Millennium Drought we’d see clouds of dust behind sheep and excessive groundcover being moved. Upon reflection, I think this has more to do with our management rather than the presence of livestock during that period. We always had the view that stock detract from soil health and I still believe poorly managed grazing certainly does. But what I saw in the US was that introducing livestock on a temporary basis has many benefits. What did your Dad Dave say when you told him you wanted to introduce cattle? Dad is on the farm with me every day. He couldn’t believe it; he was totally shocked because I’ve been pretty vocal anti-livestock for quite some time. He was pretty reluctant about the shift away from livestock initially, so he was very happy to see the lateral thinking take place. What changes did you notice as a result of the cattle? It would be easy to say nothing because they’ve just gone out and eaten grass, bogged things up, made a bit of a mess, shat everywhere. But when you look hard at soil, I trust there’s been an interaction in the soil biology as a result. If someone was to ask me for stats on that, there is none. No measurement for it. But what they have done is they’ve added a very respectable gross margin, surprisingly satisfactory. They were bought and sold on a 100 day program and their weight gain was excellent. They met all expectations and it was quite profitable. One thing I think we get too hung up on with farming systems and ag in general – right down the chain from top to bottom, researchers, consultants, farmers – we get too hung up on numbers. So many times you hear something seems like a good idea and they ask, ‘Where’s the numbers, where’s the statistical backup?’ I think that’s putting a handbrake on soil health progression. We’re in it and on it every day (our land, our soil, our environment) and sometimes I really think we need to back our own judgement in the absence of any statistical analysis. Will you include cattle in your system in the future? Yes, we will do it again. We started with a monoculture ground manure regeneration phase, and our multi species covers have replaced that phase. By adding livestock we are returning a very satisfactory gross margin. To have a regenerative phase/a cover crop which is traditionally nil income – we’ve changed that nil income year into positive income year with the cattle. The main inspiration of cattle not just trying to add biological value out of that multi species cover crop, it’s about being profitable as well. I’m still very conscious that, yes I recognise the responsibility we have to the soil and to regeneratively manage it, but I never lose sight of the financial responsibility to our family. You had a visit recently from Grant and Ken Sims, what is it like to have other innovative growers visit your farm? Grant is really leading the way in methods to reduce synthetic inputs, I think he’s an absolute inspiration for regenerative ag. He’s doing a lot of things, trying a lot of things that some of us aren’t ready to do. A lot of us aren’t ready to go there. He’s thinking about innovative ways without suffering a consequence, I really enjoyed having them. I know Grant’s a bit like me, fairly inspired by opportunities with livestock; he was pretty keen to have a look at what I was doing. Grant’s a bit further down the track, his regenerative system is a lot more advanced and he’s taken more intricate steps than what I have in promoting soil health with his inputs. It was like seeing my place through his eyes, things you’re doing yourself make more sense to you if you’re seeing them through someone else’s eyes. The encouragement and inspiration they left behind, I got a lot of value out of that. How difficult is it to find the sweet spot between regeneration and your financial responsibilities? We are still using inputs in our cropping phase, but we are putting a lot more thought into how we use those inputs. One thing we’ve managed to basically eliminate is insecticides and we are getting closer all the time to greatly reducing fungicide use. We are still using fungicides in certain instances to protect our profitability. I think to take a really hard line on synthetic inputs; I get the sense that would be neglectful to my financial responsibilities at this stage. Certainly the ultimate goal is to advance the system to the point where synthetic inputs are negligible but we’re a long way off that. This trial with cattle isn’t the first time you’ve trialled something on your farm, can you outline your approach to on-farm trials? When I trial something or do something new I try and do it on big enough relative scale that success or failure is going to have economic outcome one way or the other. This adds to authenticity of the experience. At the moment I am trialling summer cropping into winter multi covers. A sensible conservative approach would be to do a little area but I have done a big area just to substantiate the results and give it the attention it should have. When I go into a trial I’ve got the mindset that I’m going to do everything to make this work. I believe you’ve got a much better chance if you approach a trial this way – when you’ve got that big relative scale it gives you more inspiration to do what it takes to make it work. You ride the highs and the lows. Once again, it adds to authenticity of the trial. I just can’t stand missing opportunities. It gets back to the two different ways of approaching something new. Either I’m going to make this work or I’m going to see if it’s is going to work. My approach as a farmer is to make it work. You are trialling two methods of covers, one is a winter cover and summer grain crop and the other is a winter cash crop followed by a summer cover, can you please explain your rationale? Both approaches achieve green plants all year round; both are achieving multi species diversity. But which one of those systems is going to fit into our system, that’s what we’re trying to find out. It gets back again to that issue I’ve got with stats. When we say which system is going to work, it’s not a data set that’s going to reveal that. It will come down to farmer instinct on which system is giving the best regenerative outcome with the least financial impact. You can’t measure regenerative ag with stats. It just requires such a long term view. The paradigm shift to regenerative farming is not something you can do a trial on and create a data set. You just can’t go three years and create a data set of results – it’s more of a generational time span.